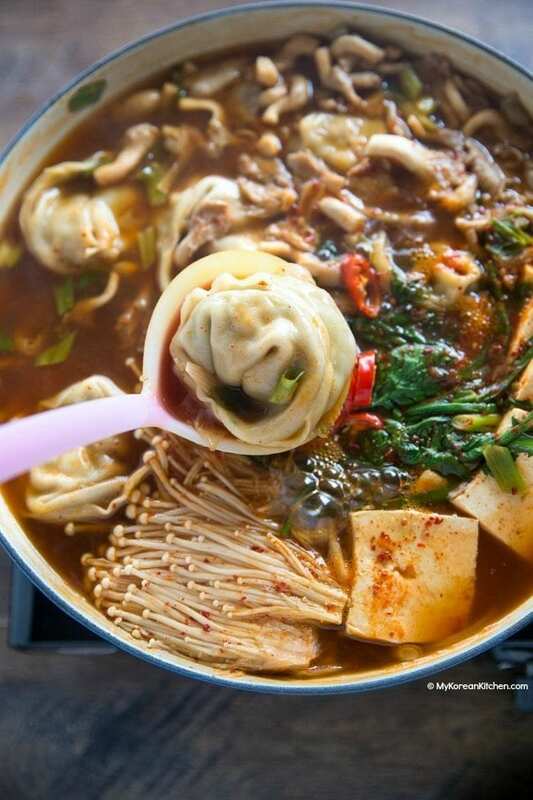 Learn how to make spicy Korean hot pot with dumplings. It’s going to be your new favorite hot pot recipe! 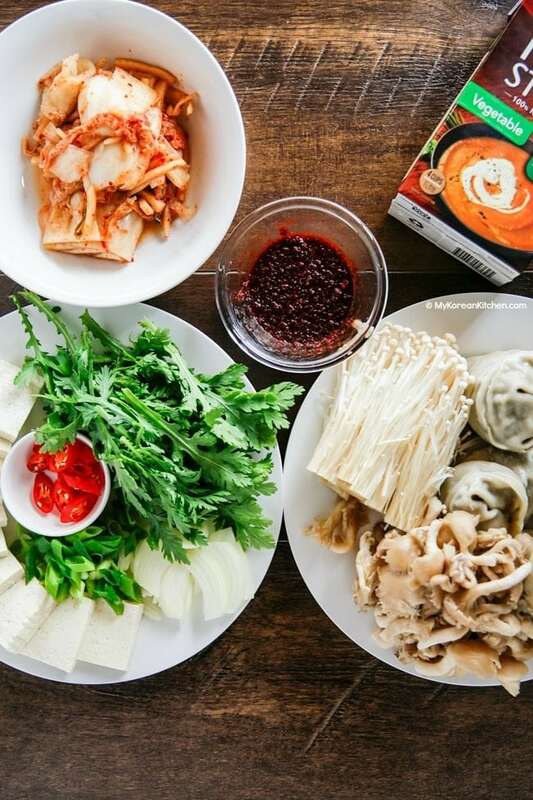 Today I’m sharing a popular Korean hot pot recipe called – Mandu Jeongol (만두 전골). 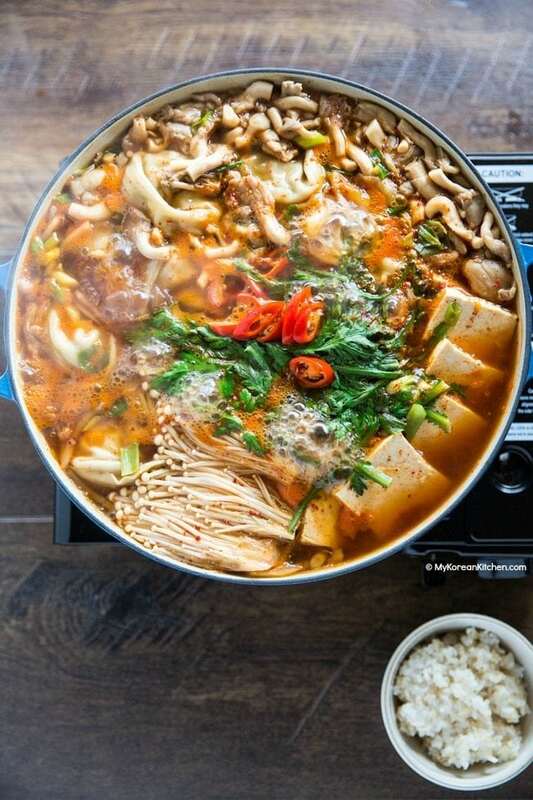 As with a typical Korean hot pot, it is loaded with a variety of ingredients, such as kimchi, tofu, mushrooms and green vegetables. 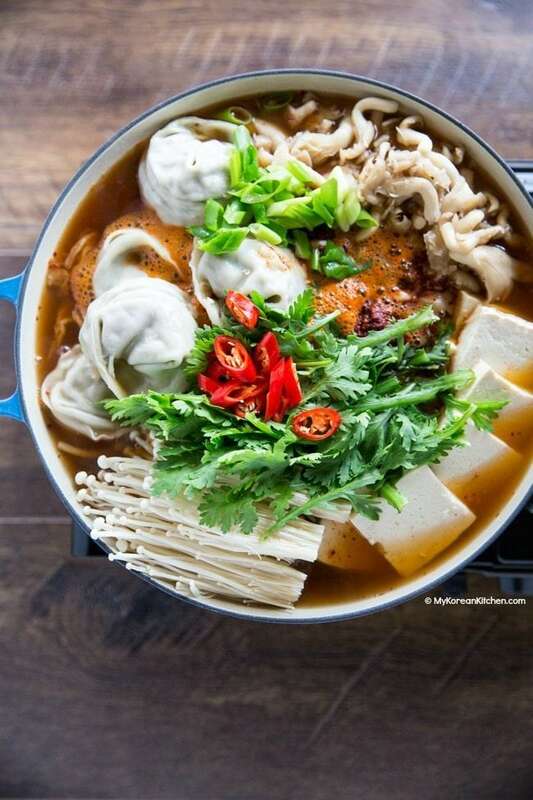 But as you can guess from the title, the highlight of this hot pot is dumplings! It’s not just any dumplings. It’s super big dumplings, so it’s very filling! Ultimately, you can use any quality or types of dumplings, but this time I made mine with seafood dumplings. It was filled with real squid, shrimps and so much more. And it was so delicious! The hot pot is prepared much like Budae Jjigae (Korean army stew), but with less unhealthy ingredients. Dumpling hot pot doesn’t include SPAM, sausages or instant ramen noodles! Maybe because of that it tasted a lot lighter and healthier. Though, my husband says budae jjigae is more fun to eat because it has a bigger range of ingredients to pick and eat from. On the other hand, my sister and I loved dumpling hot pot more because it was easier on our weight (after the fact) and tasted healthier. So if you don’t like army stew because of the high calorie count, you should definitely give this one a go. Also, while it’s optional, I highly recommend you add crown daisy / edible chrysanthemum (ssukgat, 쑥갓). It’s sold at a Korean or Asian grocery store. (But it can be tricky to find sometimes.) Anyway, it adds a really nice fragrance and subtle but distinctive flavor to the dish. I think it’s a key to making umami rich stew! Anyway, I hope you make this hot pot soon. It’s particularly a perfect stew on a rainy day or cold wintery weather! fine sea salt, if required – I didn’t use it. **If you want to learn about Korean ingredients, check my 30 essential Korean ingredients list. 1. Place the prepared ingredients in a large shallow pot. (FYI, I laid down onion and kimchi at the bottom of the pot, then arranged the remaining ingredients on top, in sections.) Boil the pot over medium high heat until rapidly boiling then reduce the heat to medium low to low. Start serving the dish as individual ingredients get ready. You may turn the heat off at any time. Serve with steamed rice. fine sea salt , if required - I didn’t use it. Place the prepared ingredients in a large shallow pot. (FYI, I laid down onion and kimchi at the bottom of the pot, then arranged the remaining ingredients on top, in sections.) Boil the pot over medium high heat until rapidly boiling then reduce the heat to medium low to low. Start serving the dish as individual ingredients get ready. You may turn the heat off at any time. Serve with steamed rice. 1. Korean Fish Sauce do you use Anchovy or Shrimp? 2. 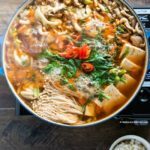 Will this Hot Pot recipe soup base work with Ramyun? 3. I usually add broccoli, onions and mushrooms. Any other veggies you think would be great? Wish I could find a place that sells the dehydrated veggie packs. I made this for dinner tonight! My husband and I really enjoyed it. I think next time I will up all the spices (we like things very spicy). I also put in ramen, and you can never go wrong with ramen in my opinion! The mandu in it is from your kimchi mandu recipe! This is my favorite food blog. Thanks for all the tasty recipes! Yes I have been busy! My husband and I lived in Korea for a year (in Sokcho, Gangwon-do). We moved away six months ago and I miss it a lot. We found the people so kind, the food so delicious, and the quality of community and living very high. We have so much respect for South Korea and Koreans. Your blog and recipes take me back and connect me with friends and memories there. I appreciate you sharing your culture so much! Hi Sue! This looks delicious! Do you think I could use frozen mandu straight from the freezer? Or should I thaw them first? Straight from the freezer is fine! Enjoy! The photo of this recipe, Mandu Jeongol, looks fantastic and I will have to try it. But will have to wait a few months to do so because in my part of the U.S. (southern Arizona), the summer is just starting and it is very hot (40-46 degrees C with no rain in sight.) Thanks for the great recipes. Totally understandable! 🙂 I will be sharing recipes that are suitable for summer next few weeks. Thanks! So many K-dramas talk about a “hot pot”. This sounds like a great recipe to try. Will let you know how it turns out!